2:53 - How does it feel being a hero to ropz? 14:30 - Are you worried about your ability to return as a full-time player? 18:00 - How far do you see Old Guys Club going? 21:02 - Can you talk about your collaboration with Udemy? 34:48 - How did it feel watching your former teammates win the Boston Major? 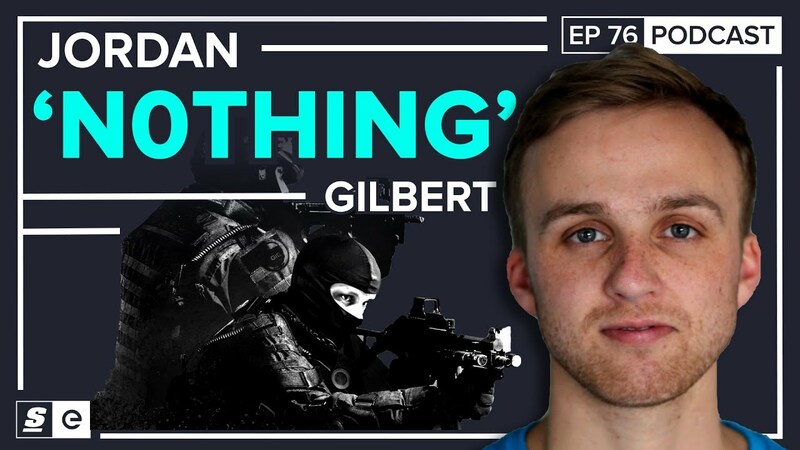 Jordan "n0thing" Gilbert is one of the most recognizable names in North American Counter-Strike. The player-turned-streamer, analyst, caster, and occasional ringer sat down with theScore esports Podcast to discuss the importance of nurturing young talent, his chances of returning as a full-time player and his favourite after-hours Cloud9 stories. Though it's been more than a year since n0thing last played CS:GO full-time, the former Cloud9 player is still exerting a lasting influence on newer players, including mousesports' breakout star Robin "ropz" Kool, who n0thing played alongside when standing in for mouz at ESL One: Belo Horizonte 2018.
ropz has gone on record before about looking up to n0thing from a young age. "That was really cool," n0thing told theScore esports. "I was talking to [ropz] about it in person, and I was realizing as he was saying it how old he is and was like, 'there's no way he really knew what was happening in the scene but he still watched my videos.'" As far as being a CS role model for up-and-coming talent goes, the line doesn't stop with ropz' generation. "It's cool that even for people who [weren't] coming up at the time when I released 'n0thing but headshots', frag movies that I did, and all that hype, were getting inspired," he said. "Even now there might some twelve-year-old who comes in late to the scene who's just an animal, and it's always neat to see that trickle-down effect of inspiration, [since] the same thing happened to me." Since n0thing's last appearance on theScore Podcast, his efforts have continued to shift away from top tier play and more towards streaming, casting, analyzing, and educating. n0thing said that while he isn't definitively retired, he does have a lot planned in terms of streaming content. "I'm kind of on the way already. I'm going in multiple directions, still," he said. "I'm not retired yet from competing, but, in the mean time... I'm trying to think of a way to interact with the scene where I could create something that was sustainable for not just me but potentially a bunch of players." As for when he'll return to pro play, n0thing said he's not too worried about his skill level decaying. "I'm not too worried if I were to play again," he said. "There's only so high of a threshold that you need to jump back into it. You just need to have decent mechanics, you need to have the framework for understanding pro-level play." Outside of streaming and filling in part-time for pro teams, n0thing has appeared on analyst and casting desks, most notably at the Boston Major in January. For the former Cloud9 player, it was a bittersweet moment watching his old teammates win North America's first Major without him. "When I saw them win... [it] was a really positive feeling for me," he said. "Honestly, I wasn't really [bitter]," he said. "Obviously, [I] wish I won a Major, just like every player wishes they won a Major, but not, like, 'Oh, f--k these guys.' I think it was actually best that the team made those decisions to part ways. I probably should have left the team earlier, or changed something on the team earlier, when I had a little bit more say in what would happen." Besides streaming, playing and appearing on analyst desks, n0thing is currently focused on is his partnership with Udemy, an online platform where users can either upload or enrol in virtual courses. He's created a course specifically designed to teach newer and more experienced players alike how to approach CS:GO like a pro. "One of the things I talk about in the course is mentorship," he said. "That's kind of what I'm doing right here but, beyond my course, I encourage people to go watch YouTube, go play with and against better players, and then go find mentors... I think that [that's] one of the biggest things that launched me to be a pro at such a young age." Editor's note: This interview was recorded on Aug. 30, 2018.